You know that I love cushions and I have quite some in my stash, but I didn’t have a sunscreen cushion in my collection until recently. 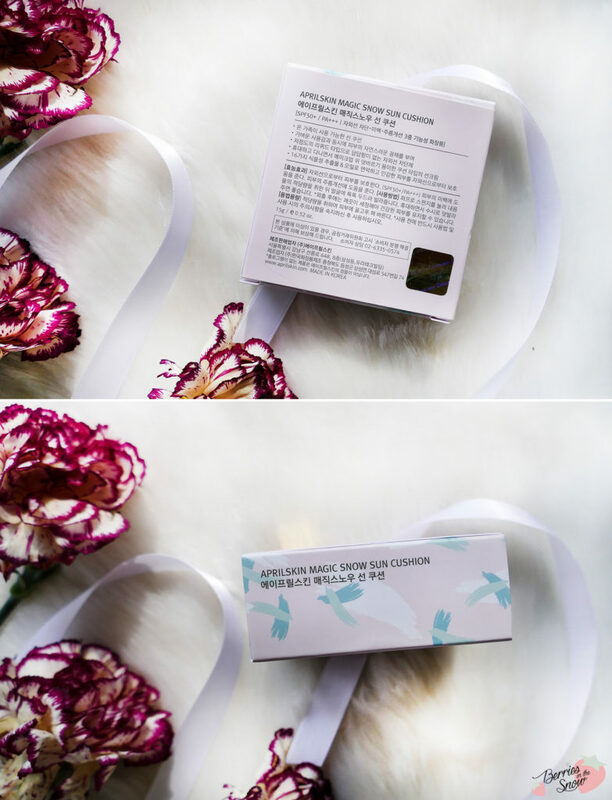 During last summer vacation, I thought that it might be nice to try a sunscreen cushion for touching up the sun protection during the day and therefore I decided to go with the Aprilskin Magic Snow Sun Cushion in a first test which was provided to me for reviewing purpose by StyleKorean. 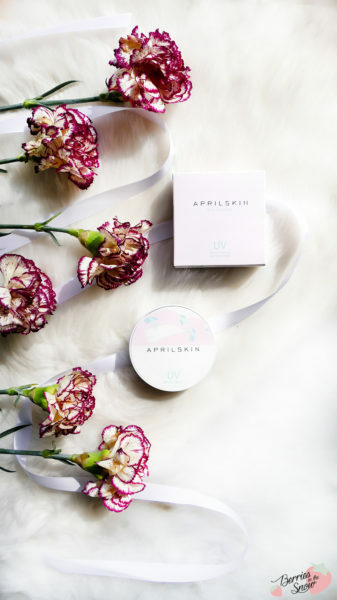 Aprilskin is a Korean natural cosmetics brand which was raved a lot about during last year, especially for their cushion foundation. 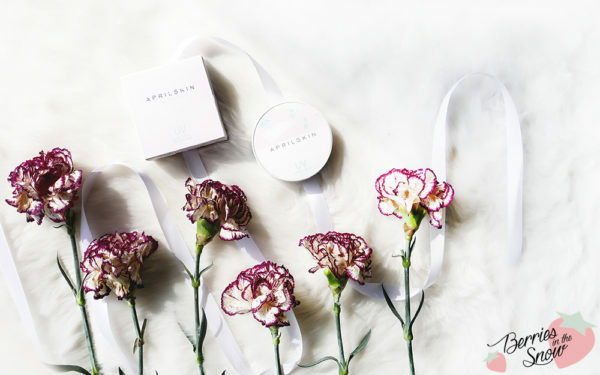 The brand is fairly young and was founded in 2014, but since then has won a numerous amount of prizes for their products. All though I love cushions I didn’t buy ny of their raved cushions and so I was happy to be asked by StyleKorean and be able to choose a product from this brand. I decided for the Aprilskin Magic Snow Sun Cushion. 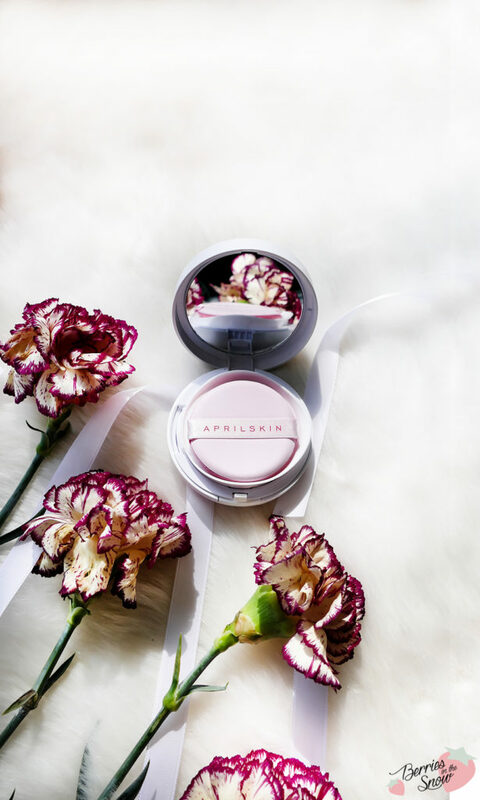 The Aprilskin Magic Snow Sun Cushion is an ultra-lightweight sunscreen that comes in a cushion compact. It is mildly formulated, making it suitable for children and adults according to the description. Furthermore, it doesn’t leave a white cast and yet has SPF 50+ /PA+++. 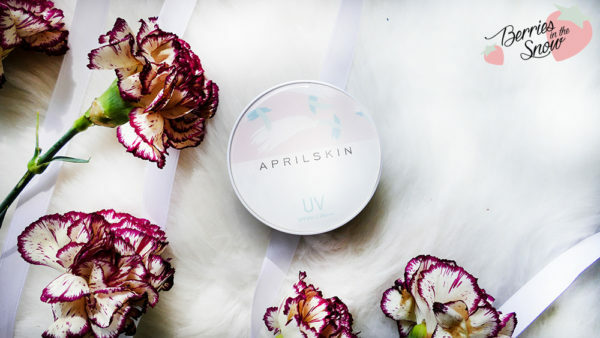 The UV-protection is mineral based and still, it claims to leave no white traces. As you know, sun protection has to be renewed from time to time, but I personally am quite a lazy person. I discovered that I hardly ever touch up my sun protection on my skin and a cushion would make that far easier than a tube. 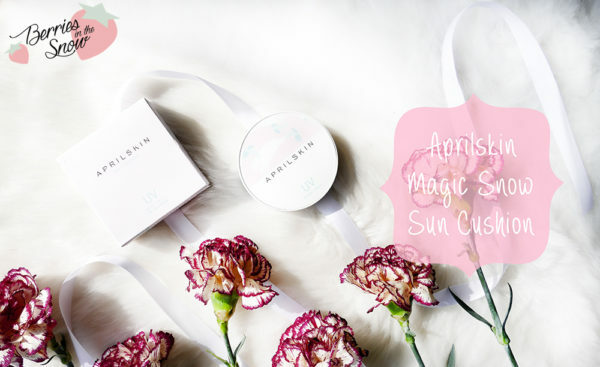 The Aprilskin Magic Snow Sun Cushion comes packed in a cardboard box in a light pink color. 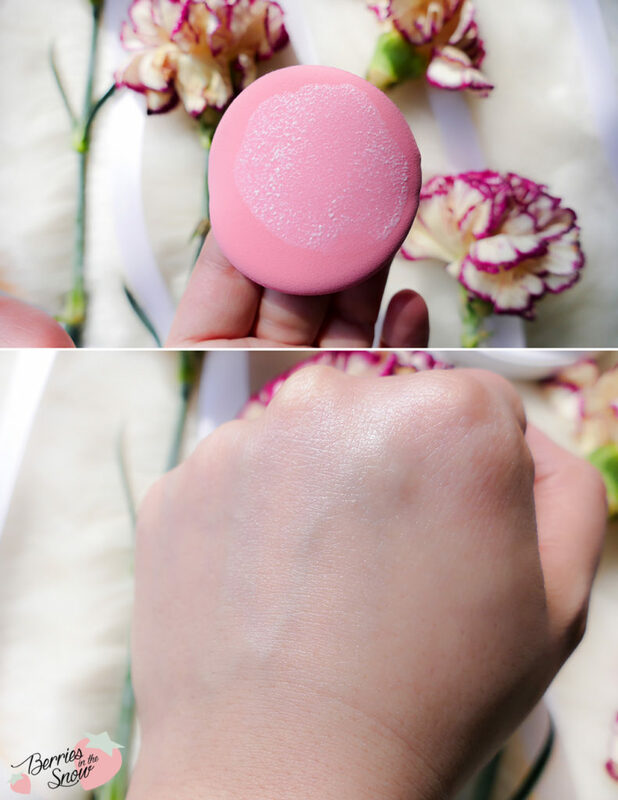 The cushion compact itself has also a nice pink pattern on the lid and looks really feminine. The description on the cardboard box is only in Korean, but Aprilskin’s official site offers an English translation, too. I marked the sunscreens within the list in blue. Frankly, I’m no sunscreen expert. The field is so complex and until now I never had the time to really go deep into the topic. The product description says, that this cushion only uses physical sunscreen. I spot already two chemical sunscreens from looking at the list: Octinoxate (Ethylhexyl Methoxycinnamate) and Avobenzone (Butyl Methoxydibenzoylmethane)….mh…that’s the first disappointment … Checking the other sunscreens I spot that Octocrylene and Diethylamino Hydroxybenzoyl Hexyl Benzoate (Uvinol A Plus) are chemical sunscreens, too. Commonly used physical sunscreens are Titanium Dioxide and Zinc Oxide, but I do not spot any of these here. I’m quite confused…is this product using physical sunscreens at all?! 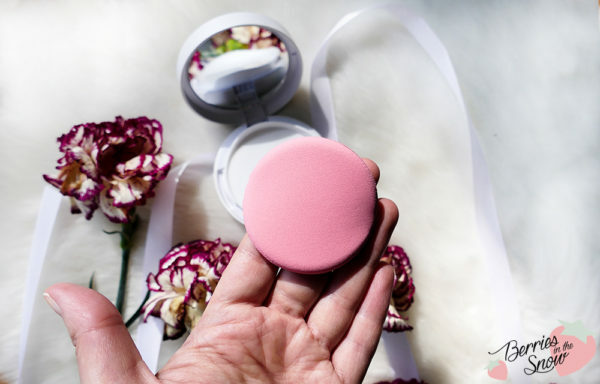 Inside the cushion compact is the typical application sponge. In order to use the sunscreen cushion, you dab the application puff on the cushion sponge until the product is transferred. Then you dab the puff on your face in a patting motion. Don’t smear or rub it on the skin. 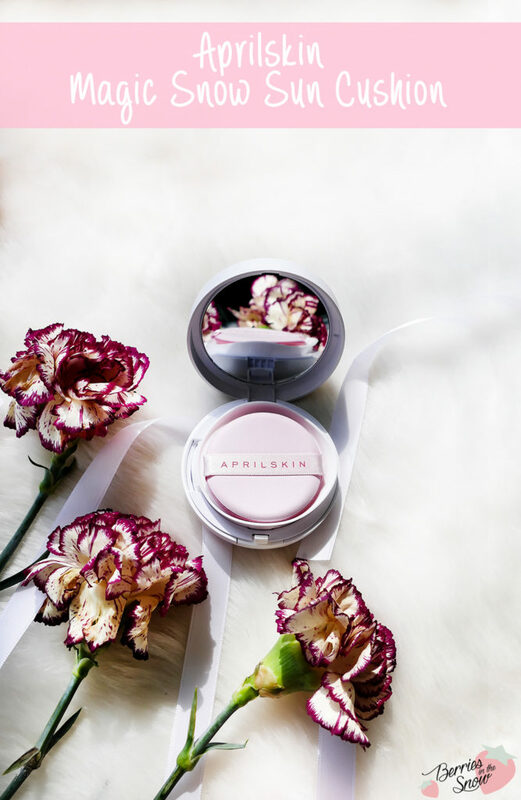 Of course, the cushion compact comes with a mirror inside the lid, too, so it is perfect for carrying around and use it while not at home, too. Unlike cushion foundations, the sponge in the compact is not soaked with BB Cream or Foundation, but with sunscreen. Therefore the color of the sponge is white. The sunscreen has a creamy consistency. It gives a visible glow to the skin but doesn’t leave any white cast. While applying it on the skin I can feel a cooling effect of the product. The scent of it is also flowery/fresh. It contains some plant-based ingredients like Lavandula, chamomile, and tea tree oil, which create the scent of the product. I didn’t have any problems with the application of the product and it also can be touched up and layered without any further problems. Aprilskin Magic Snow Sun Cushion has a nice texture and finish, but I’m disappointed that it is not a physical sunscreen as it states on their page. I personally am not someone who refuses any chemical sunscreens, but I prefer it if the description of products are correct. As I said, I’m no sunscreen expert, so if there is anyone who can explain more about the chemicals used here I would be happy to hear about it. Let me know in the comments or write me an email/PN. Oh, and since some of the chemical sunscreens may have effects on hormones and hormonal pathways I would not use this sunscreen on children, despite its mild formulation. I received this product from StyleKorean, but they do not have it listed in their shop at the moment. They have other cushions from Aprilskin though, so have a look if you are interested. The Aprilskin Magic Snow Sun Cushion retails for 26.99 US$ from Amazon. Did you try any sunscreen cushion already? If you have a favorite let me know. Oh, and what is your favorite sunscreen? I’d be interested to hear about it. Just as a short reminder: All products mentioned and reviewed on this blog are of my personal opinions. This product here was sent to me for reviewing purpose by https://www.stylekorean.com/ which doesn’t influence me in providing my honest opinion on the products. My issue with cushion sunscreens is that brands leave people with the impression you can apply one very sheer level of sunscreen and it’s effectively protecting you with the SPF 50 which is absolutely not the case. If this was to be used properly, the cushion will be finished in a week or so. It’s not like I am absolutely against sunscreen cushions but it’s kind of misleading and false marketing. Plus claiming that the cushion is only physical (and cast-free which is already bizarre) and having chemical filters only in the ingredients list… The nicest thing I could say this is very odd. I’ve never heard of cushion sunscreens, this looks like a very interesting product, it’s a pity it’s not a physical sunscreen! 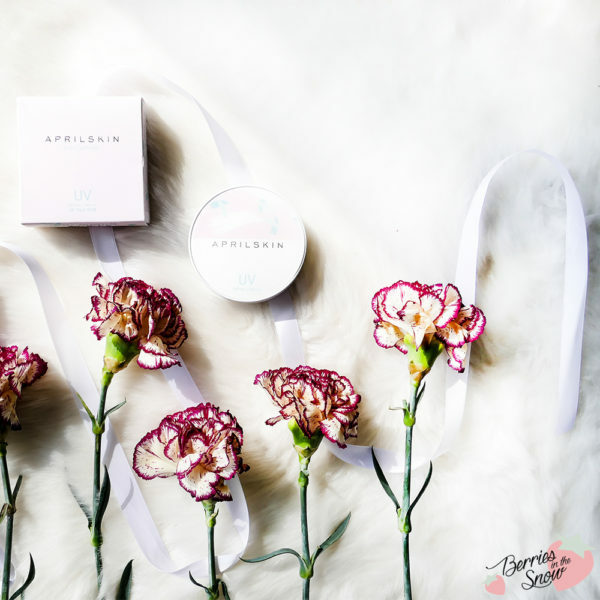 Super cooler Post :) Zur Zeit sind Kreanosche Beauty Produkte ja total im Trend. Das hier hört sich auf jeden Fall cool an. Ich bin zwar auch kein Sonnencreme Experte, aber das Konzept gefällt mir. Wow, darüber habe ich ja noch nie etwas gehört. Hört sich für mich aber definitiv spannend an.